I love ketchup. Even if I don't know the correct spelling whether it be Heinz's spelling of "catsup" or Del Monte's "ketchup" and even others spelled "kechup", I still love it. I do love the original tomato ketchup, the sour kind. I love garnishing french fries, meat, pizza, fish and just about anything with kechup. For me, ketchup is made from tomato and nothing else. So I don't like banana ketchups like Jufran and UFC. One exception is when I eat at Max's Chicken. They don't serve any tomato ketchup. Surprisingly enough, banana ketchup is a good mix with their chicken. 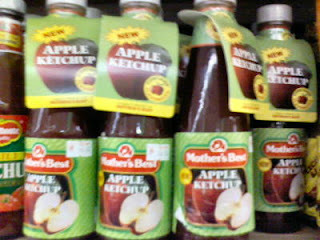 So seeing this new ketchup product had my eyebrows raised and mouth wide open in astonishment. I hope they don't come out with pineapple, melon or guava ketchups. I just don't dig fruit-flavored ketchups. Wait a minute. Is tomato a fruit ? I love ketchup too Sweetie and like you I don't know which is the right spelling of catshup, ketshup, kechap, in Indonesia it's kecap! Arggghhh! Basta I love it especially on my eggs for breakfast (kelangan masanay ka na Sweetie).